Confusion, diatribes, mudslinging, image smearing and animosity characterised the first consultative talks as the search for the successor of the late Paramount ruler of the Bakweris, Nakuve Chief Justice Samuel Moka Lifafa Endeley, heightens. The consultative talks, which were initiated by the Fako Senior Divisional Officer, SDO, Emmanuel Engamba Ledoux, brought together the Divisional Officer for Buea, Paul Wokam Kouam, the Mayor of Buea, Patrick Ekema Esunge, Chiefs, family heads, kingmakers, elders and the entire Buea populace. The meeting was held at the legendary ‘Palapala’ Field, Buea Town, on Friday, November 10. Despite the chilly and foggy weather conditions, thousand still braved the odds and thronged the venue. With such a massive turnout, many already anticipated fireworks at the meeting. When Ledoux and his entourage cruised into the ceremonial ground, the meeting quaked off with the SDO refusing the presentation of a welcome address. The administrator’s refusal to entertain a welcome speech made the elders twitchy. They murmured in small constituted groups on while the SDO will refuse their ‘legendary hospitality’. Addressing the population, the administrator said they have not come to choose a Paramount Chief for Buea, but, they have rather come to choose a Chief for Buea. Ledoux then requested the list of family heads that are traditionally empowered to choose a Chief for Buea. Stepping forward, one of the elders said Buea has 25 family heads, which have the legitimate right to designate a Chief for Buea. He called out the family heads while the SDO and his entourage noted. Taking the floor, the Chairman of the Traditional Council under the late Chief, Dr. Humphrey Ekema Monono, who is also Registrar of the Cameroon GCE Board, said he was surprised with the first list presented by the notables. According to him, from time immemorial, Buea has had 16 family heads which are duly gazetted. He said some of the 16 family heads have died while others have been added to the list to cater for the cosmopolitan nature of Buea. The list of the 16 legitimate family heads, the Traditional Council Chairperson said, has been given to the Fako administration and that any addition may have been done without the knowledge of the Traditional Council, which he chairs. After Monono’s utterances about the number of family heads, hell broke loose. Meanwhile, after listening to the Traditional Council Chairperson with disdain, Hon Ray Lyonga Ekundi, former Adviser to the late Chief, former Secretary General of the Buea Traditional Council and the Vice Chairman to the late Paramount Chief, sprang from his seat and challenged that Monono has no legitimate right to present a list on the Buea Chieftaincy stool, because, according to him, “Monono is not a Buea man”. Going by Hon Ray, all the documents Monono was presenting on behalf of the Traditional Council were apparently forged documents. 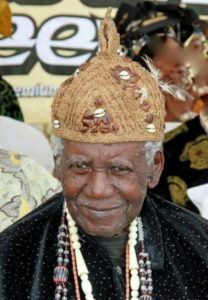 He explained that when a cabal within the palace realised that the late Chief was very old and could not do anything for himself, they went behind his back and designated four families to be calling the shots. He said Buea has no Traditional Council. “The Buea Traditional Council is dead and gone with the Chief,” he charged. Seizing the floor, Moses Njuma Ekeke, advised the Fako administration that the first thing they as administrators ought to have done was to first identify who has the legitimate right to present the family heads of Buea. He questioned under what basis Ekema Monono presented the family heads in Buea, when he (Monono) does not hail from Buea. As another elder whose name, The Post got as Mola Loka Nganje aka Sura, stepped forward to vouchsafe a word, a group of young hefty men who were also present, rained insults and invectives on him. One of them went as far as manhandling the old man, shoving him off the ceremonial ground. Poor Loka was only rescued by the SDO from the hands of the thugs. In response, Ledoux scorned at the uncouth manner in which Loka was treated and decided to listen to him. Grabbing the microphone, the feasibly rough-handled Loka said he was the former bodyguard of the late Paramount Chief. According to him, it was still a real kick in the teeth as some elders refused to listen to Ekema Monono on grounds that he was not a Buea man. Leaping again from his seat, apparently to redeem his battered and smeared image, Ekema Monono boasted that he is the last Head of the Buea Traditional Council. Monono took a shuttle whack at Hon Ekundi and reminded him that he was a man from Wonjava in the Bonjongo court area, and not from Buea. He further warned that he will go to the archives and get the data of anybody who is trying to run him down. Quoting Article 11 of the Chieftaincy Law, Ledoux said Chiefs are selected by the competent elders before they are crowned. According to him, the village is divided now into four different segments. While some people think that there are 25 family heads that must sit together to designate a Chief, others think that only 16 have the legitimate right to provide a Chief. Yet another group talks of 13 and yet another talks of three. Meantime, as the consultative talks dragged on, anger brewed and tempers flared but the SDO advised the Kuvas, Likenyes and the Endeleys that constitute the Royal Family to sit together, designate the next Chief and then inform the administration. He warned that if the Royal Family failed to choose a Chief amongst themselves, then the other family heads will be brought in and the matter settled by vote. He also advised the other families to go and choose their respective family heads. According to him, before the next consultative talks, any family that has not chosen its representative will simply be discarded. However, many feared that the SDO’s advice may not yield any fruit since the Royal Family is in fracas over the succession question. Two Princes have, on two different occasions, been paraded as successors to the fallen legal colossus. On April 6, 2016, a segment of the Likenya family rolled out the traditional drums of the Bakweri people in ecstatic jubilation in what they termed “the emergence of a new Paramount Ruler”. In that profligate ceremony, Robert Esuka Endeley, son of Dr. Emmanuel Mbella Lifafa Endeley, was named as the new Paramount Ruler. However, Esuka Endeley’s candidature was later rejected on June 26, 2016, when the Kingmakers of the Buea first-class Chiefdom met in an enlarged in-camera conclave at the Mokunda Palace, under the canopy of the Traditional Council. After intense deliberations, Prince Charles Efugani Endeley emerged as the successor of the late Nakuve. It is an open secret in Buea that the children of Dr. Emmanuel Mbella Lifafa Endeley, led by Dr. Robert Esuka Endeley, want their father’s throne which was reportedly given to the late Nakuve to be reverted to them. According to reports, SML Endeley inherited the Buea traditional stool from his uncle and not his father as prescribed by the Bakweri succession laws. Reports hold that when Chief Gervacius Endeley died, Dr. EML Endeley was chosen to succeed him. But the former Premiere of former British Southern Cameroons was not psychologically prepared to lead his people. As such, he declined from his royal responsibilities, suggesting that the throne should be handed over to his younger brother, Justice SML Endeley. After the demise of the former Chief Judge, the family of Dr. EML Endeley thinks that it is their turn to rule the Buea people. Even at the consultative talks, two camps were already itchy to declare their various candidates but for the restrain of the SDO. Such conflict of interest may only help deprive the Buea people of a traditional leadership for many years. Speaking at the event, Prince Alexander Ngumba Endeley, appealed to the SDO not to trade the same path which his predecessors took before their late father was finally designated. According to him, their late father was finally designated by the Prime Minister 10 years after Buea had been without a Paramount Ruler. In his closing remarks, the Fako SDO said if the royal family failed to produce a single candidate as Chief, the administration will simply go back and adopt the method which led to the designation of the late Chief. According to some elders, the late Paramount Ruler of the Bakweris was chosen by the family, confirmed by the Kingmakers without objection and presented to the administration. PM To Appoint New Buea Paramount Chief? Meanwhile, Ledoux stated that the Prime Minister has the constitutional prerogative to appoint a new Paramount Chief of Buea, like was the case with the late Chief. He said this can only happen if there is infighting in the family. “My greatest wish is to begin the New Year with a new Paramount Chief of Buea,” Ledoux stated.